Fourth book in the steamy Regency historic romance series, Noble Passions, from Sabrina York. Recovered, newly re-released and now available, read on to find out just why this series is a must-read. Another visit with the Moncrieff and the McCloud, two names that strike fear and awe in the hearts of men, and encourage nothing but recalcitrance, eyerolls and outright defiance from their women. I adore this series for the spirited, brave and smart heroines who drive their male relations and lovers to distraction with their single-minded determination and refusal to cower under the threat of societal censure. Those who have read the series will know of the rather unusual connections between the families, and the loyalties, humor and true passions that define them. In this story, Sophia the younger sister of Ewan has managed to survive three seasons in London without accepting a single proposal of marriage to the twenty seven men who have offered for her hand. Ewan, his heart in the right place, wants to continue to protect and guide his sister into a life free from care or worry, unlike their younger years. Sophia, however, is not interested in any of those men: she wants Ned. And adventures: constantly battling the ‘no cakes’, ‘no adventure’, no FUN restrictions on young women of her station, Sophia is constantly looking for distraction. Ned, for his part is mired in his own feelings of uselessness and not being ‘enough’ to offer for Sophia. He has managed his desires for her by being the most unpleasant and disagreeable man he can to her: just testing the edges of politeness when they come in contact. When yet another night out results in his purchasing a horse and losing at cards, all debts that will be paid by his brother the Earl of Moncrieff, it is decided that Ned will be sent away to Italy to learn some responsibility, and curtail his friendships with disagreeable young rakes of London. From here, the story takes Ned and Sophia on adventures galore: rough seas, a disabled ship, pirates, an attempt to escape foiled at the last minute and then a stand-off with the pirate captain, the returning Sophia is bold, determined and ever so angry when Ned, reacting from his instinct to protect, jumps in front of the gun and takes a bullet meant to kill his brother. If you are looking for a ‘traditional’ Regency with simpering heroines, rakes who care only about themselves and a strict adherence to the expectations of society – you need to look elsewhere. The men have worked diligently to assure their place in society, and play with their well-deserved reputations to assure acceptance, cache and an element of “don’t mess with us” that is prominent in every drawing room in London. The women are smart, determined, loyal and as honest as they need to be in their pursuit of their own desires. Sophia is no wilting flower, her early years had her well aware of the goings-on between men and women, and her self-confidence and curiosity combined with her good-nature and enjoyment of all things “adventurous’ have her leading Ned by the nose, or other projecting parts, to her ultimate goal. This book was a grand adventure, but I cannot wait for the next from this author! Until a scratch came at the door. And then a knock. And then a rattling pound. It was unnecessary for Ewan to break it down as he did. “Yes, Ned,” she said. “I enjoyed it very much. It had been a grand adventures. She never wanted another adventure again. 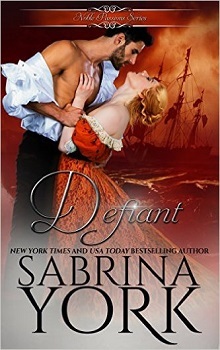 Brigand: Noble Passions # 4 by Sabrina York with Extras! !